I have a confession to make… I’ve never ever used a BlackBerry . I’ve been an iPhone owner since Gen 1, and frankly, can’t even figure out how to operate an Android device (I tried). BlackBerry was never even a consideration to the point that I never bothered to take its platform seriously. This is why when a friend told me about a BlackBerry app developed by an Israeli startup that he claimed was ‘killing it,’ I dismissed it with a wave of the hand. I was so oblivious that I nonchalantly waved off a fanatical 80 million-strong user base that, arguably, is the biggest neglected opportunity of app developers. 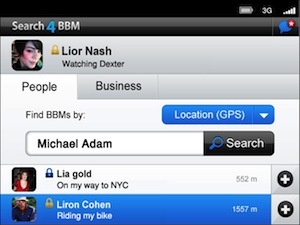 Luckily for the folks behind Search4BBM they neglected every other platform, but BlackBerry’s. The app they developed was for an opportunity so obvious it falls under the ‘you must be shitting me!’ department. 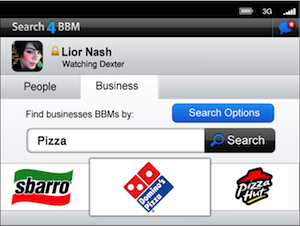 Get this: Search4BBM is a 411 / Yellow Pages for BBM private users and BBM businesses. It’s such a must-have that 1M BlackBerry users use it every single day. Take a step back and try to imagine Facebook without being able to search with a user’s name to find his or her Profile. That’s how obvious this feature is. It’s such a broken reality for BBM users that they are posting their BlackBerry pins on Facebook Wall posts to get in touch with each other. The reason the feature is missing most likely dates to a pre-social era. So why, then, wouldn’t BlackBerry just bake it in now you ask? Well, consider that the company has everything riding on BB10 and at its core is a nascent developer community. Were BlackBerry to be foolishly suicidal enough to bake this feature into BB10, it would literally implode upon itself the app ecosystem it so direly needs for the sustainability of its bright, new, shiny platform. The act of ripping off an up-and-coming app developer would be a catastrophic signal for the entire BlackBerry developer community. It would be ‘game over’ for the development of killer apps. Paranoid conspiracy theories aside, here are some numbers the company shared with me: 1 million global users, 6 million searches per month, and 650,000 PIN code requests per month. All of this is completely viral traction as the company claims it has yet to spend a dime on marketing. The free app isn’t fancy, it’s just effective. As noted above, users can search for private BBM users, as well as businesses with filters for location, gender, age, positions, company, and category. There’s also a way to search for Facebook friends (wild, I know). Search4BBM is a great example of going against trends and developing for opportunity. The fact that the company is completely self-funded makes its 1 million-strong userbase an even sweeter story.